A confidence interval for a population mean with a known standard deviation is based on the fact that the sample means follow an approximately normal distribution. Suppose that our sample has a mean of and we have constructed the 90% confidence interval (5, 15) where EBM = 5. To construct a confidence interval for a single unknown population mean μ, where the population standard deviation is known, we need is the point estimate of the unknown population mean μ. The margin of error (EBM) depends on the confidence level (abbreviated CL). The confidence level is often considered the probability that the calculated confidence interval estimate will contain the true population parameter. However, it is more accurate to state that the confidence level is the percent of confidence intervals that contain the true population parameter when repeated samples are taken. Most often, it is the choice of the person constructing the confidence interval to choose a confidence level of 90% or higher because that person wants to be reasonably certain of his or her conclusions. There is another probability called alpha (α). α is related to the confidence level, CL. α is the probability that the interval does not contain the unknown population parameter. Mathematically, α + CL = 1. Suppose we have collected data from a sample. We know the sample mean but we do not know the mean for the entire population. The sample mean is seven, and the error bound for the mean is 2.5. The confidence interval is (7 – 2.5, 7 + 2.5), and calculating the values gives (4.5, 9.5). Suppose we have data from a sample. The sample mean is 15, and the error bound for the mean is 3.2. What is the confidence interval estimate for the population mean? A confidence interval for a population mean with a known standard deviation is based on the fact that the sample means follow an approximately normal distribution. Suppose that our sample has a mean of , and we have constructed the 90% confidence interval (5, 15) where EBM = 5. To get a 90% confidence interval, we must include the central 90% of the probability of the normal distribution. If we include the central 90%, we leave out a total of α = 10% in both tails, or 5% in each tail, of the normal distribution. To capture the central 90%, we must go out 1.645 “standard deviations” on either side of the calculated sample mean. The value 1.645 is the z-score from a standard normal probability distribution that puts an area of 0.90 in the center, an area of 0.05 in the far left tail, and an area of 0.05 in the far right tail. It is important that the “standard deviation” used must be appropriate for the parameter we are estimating, so in this section we need to use the standard deviation that applies to sample means, which is . The fraction , is commonly called the “standard error of the mean” in order to distinguish clearly the standard deviation for a mean from the population standard deviation σ. When the population standard deviation σ is known, we use a normal distribution to calculate the error bound. Calculate the sample mean from the sample data. Remember, in this section we already know the population standard deviation σ. Find the z-score that corresponds to the confidence level. Calculate the error bound EBM. We will first examine each step in more detail, and then illustrate the process with some examples. When we know the population standard deviation σ, we use a standard normal distribution to calculate the error bound EBM and construct the confidence interval. We need to find the value of z that puts an area equal to the confidence level (in decimal form) in the middle of the standard normal distribution Z ~ N(0, 1). The confidence level, CL, is the area in the middle of the standard normal distribution. CL = 1 – α, so α is the area that is split equally between the two tails. Each of the tails contains an area equal to α2. The z-score that has an area to the right of α2 is denoted by zα2. For example, when CL = 0.95, α = 0.05 and α2 = 0.025; we write zα2=z0.025. The area to the right of z0.025 is 0.025 and the area to the left of z0.025 is 1 – 0.025 = 0.975.
zα2=z0.025=1.96, using a calculator, computer or a standard normal probability table. Remember to use the area to the LEFT of ; in this chapter the last two inputs in the invNorm command are 0, 1, because you are using a standard normal distribution Z ~ N(0, 1). The graph gives a picture of the entire situation. Suppose scores on exams in statistics are normally distributed with an unknown population mean and a population standard deviation of three points. A random sample of 36 scores is taken and gives a sample mean (sample mean score) of 68. Find a confidence interval estimate for the population mean exam score (the mean score on all exams). Find a 90% confidence interval for the true (population) mean of statistics exam scores. You can use technology to calculate the confidence interval directly. The first solution is shown step-by-step (Solution A). The second solution uses the TI-83, 83+, and 84+ calculators (Solution B). 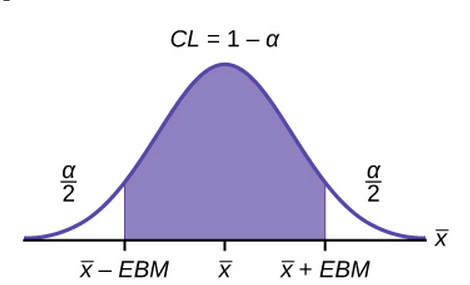 To find the confidence interval, you need the sample mean, and the EBM. The area to the right of z0.05 is 0.05 and the area to the left of z0.05is 1 – 0. Using invNorm(0.95, 0, 1) on the TI-83,83+, and 84+ calculators. This can also be found using appropriate commands on other calculators, using a computer, or using a probability table for the standard normal distribution. The 90% confidence interval is (67.1775, 68.8225). Arrow to Stats and press ENTER. Arrow down and enter three for σ, 68 for , 36 for n, and .90 for C-level. The confidence interval is (to three decimal places)(67.178, 68.822). We estimate with 90% confidence that the true population mean exam score for all statistics students is between 67.18 and 68.82. Ninety percent of all confidence intervals constructed in this way contain the true mean statistics exam score. For example, if we constructed 100 of these confidence intervals, we would expect 90 of them to contain the true population mean exam score. Suppose average pizza delivery times are normally distributed with an unknown population mean and a population standard deviation of six minutes. A random sample of 28 pizza delivery restaurants is taken and has a sample mean delivery time of 36 minutes. Find a 90% confidence interval estimate for the population mean delivery time. The Specific Absorption Rate (SAR) for a cell phone measures the amount of radio frequency (RF) energy absorbed by the user’s body when using the handset. Every cell phone emits RF energy. Different phone models have different SAR measures. To receive certification from the Federal Communications Commission (FCC) for sale in the United States, the SAR level for a cell phone must be no more than 1.6 watts per kilogram. This table shows the highest SAR level for a random selection of cell phone models as measured by the FCC. Find a 98% confidence interval for the true (population) mean of the Specific Absorption Rates (SARs) for cell phones. Assume that the population standard deviation is σ = 0.337. To find the confidence interval, start by finding the point estimate: the sample mean. Next, find the EBM. Because you are creating a 98% confidence interval, CL = 0.98. You need to find z0.01 having the property that the area under the normal density curve to the right of z0.01 is 0.01 and the area to the left is 0.99. Use your calculator, a computer, or a probability table for the standard normal distribution to find z0.01 = 2.326. We estimate with 98% confidence that the true SAR mean for the population of cell phones in the United States is between 0.8809 and 1.1671 watts per kilogram. Arrow down to 7: ZInterval. The confidence interval is (to three decimal places) (0.881, 1.167). This table shows a different random sampling of 20 cell phone models. Use this data to calculate a 93% confidence interval for the true mean SAR for cell phones certified for use in the United States. As previously, assume that the population standard deviation is σ = 0.337. We estimate with 93% confidence that the true SAR mean for the population of cell phones in the United States is between 0.8035 and 1.0765 watts per kilogram. Notice the difference in the confidence intervals calculated in Example 3 and the Try It just completed. These intervals are different for several reasons: they were calculated from different samples, the samples were different sizes, and the intervals were calculated for different levels of confidence. Even though the intervals are different, they do not yield conflicting information. The effects of these kinds of changes are the subject of the next section in this chapter. Suppose we change the original problem in Example 2 by using a 95% confidence level. Find a 95% confidence interval for the true (population) mean statistics exam score. Notice that the EBM is larger for a 95% confidence level in the original problem. We estimate with 95% confidence that the true population mean for all statistics exam scores is between 67.02 and 68.98. Ninety-five percent of all confidence intervals constructed in this way contain the true value of the population mean statistics exam score. The 90% confidence interval is (67.18, 68.82). The 95% confidence interval is (67.02, 68.98). The 95% confidence interval is wider. If you look at the graphs, because the area 0.95 is larger than the area 0.90, it makes sense that the 95% confidence interval is wider. To be more confident that the confidence interval actually does contain the true value of the population mean for all statistics exam scores, the confidence interval necessarily needs to be wider. Increasing the confidence level increases the error bound, making the confidence interval wider. Decreasing the confidence level decreases the error bound, making the confidence interval narrower. Refer back to the pizza-delivery Try It exercise. The population standard deviation is six minutes and the sample mean deliver time is 36 minutes. Use a sample size of 20. Find a 95% confidence interval estimate for the true mean pizza delivery time. Suppose we change the original problem in Example 2 to see what happens to the error bound if the sample size is changed. Leave everything the same except the sample size. Use the original 90% confidence level. What happens to the error bound and the confidence interval if we increase the sample size and use n = 100 instead of n = 36? What happens if we decrease the sample size to n = 25 instead of n = 36? σ = 3; The confidence level is 90% (CL=0.90); . If we increase the sample size n to 100, we decrease the error bound. If we decrease the sample size n to 25, we increase the error bound. Increasing the sample size causes the error bound to decrease, making the confidence interval narrower. Decreasing the sample size causes the error bound to increase, making the confidence interval wider. Refer back to the pizza-delivery Try It exercise. The mean delivery time is 36 minutes and the population standard deviation is six minutes. Assume the sample size is changed to 50 restaurants with the same sample mean. Find a 90% confidence interval estimate for the population mean delivery time. When we calculate a confidence interval, we find the sample mean, calculate the error bound, and use them to calculate the confidence interval. However, sometimes when we read statistical studies, the study may state the confidence interval only. If we know the confidence interval, we can work backwards to find both the error bound and the sample mean. OR, from the upper value for the interval, subtract the lower value. Then divide the difference by two. OR, average the upper and lower endpoints of the confidence interval. Notice that there are two methods to perform each calculation. You can choose the method that is easier to use with the information you know. Suppose we know that a confidence interval is (67.18, 68.82) and we want to find the error bound. We may know that the sample mean is 68, or perhaps our source only gave the confidence interval and did not tell us the value of the sample mean. If we know that the sample mean is 68: EBM = 68.82 – 68 = 0.82. If we don’t know the sample mean: . If we don’t know the error bound: . Suppose we know that a confidence interval is (42.12, 47.88). Find the error bound and the sample mean. The formula for sample size is , found by solving the error bound formula for n.
In this formula, z is , corresponding to the desired confidence level. A researcher planning a study who wants a specified confidence level and error bound can use this formula to calculate the size of the sample needed for the study. The population standard deviation for the age of Foothill College students is 15 years. If we want to be 95% confident that the sample mean age is within two years of the true population mean age of Foothill College students, how many randomly selected Foothill College students must be surveyed? From the problem, we know that σ = 15 and EBM = 2.
z = z0.025 = 1.96, because the confidence level is 95%. using the sample size equation. Use n = 217: Always round the answer UP to the next higher integer to ensure that the sample size is large enough. Therefore, 217 Foothill College students should be surveyed in order to be 95% confident that we are within two years of the true population mean age of Foothill College students. The population standard deviation for the height of high school basketball players is three inches. If we want to be 95% confident that the sample mean height is within one inch of the true population mean height, how many randomly selected students must be surveyed? “American Fact Finder.” U.S. Census Bureau. Available online at http://factfinder2.census.gov/faces/nav/jsf/pages/searchresults.xhtml?refresh=t (accessed July 2, 2013). “Disclosure Data Catalog: Candidate Summary Report 2012.” U.S. Federal Election Commission. Available online at http://www.fec.gov/data/index.jsp (accessed July 2, 2013). “Headcount Enrollment Trends by Student Demographics Ten-Year Fall Trends to Most Recently Completed Fall.” Foothill De Anza Community College District. Available online at http://research.fhda.edu/factbook/FH_Demo_Trends/FoothillDemographicTrends.htm (accessed September 30,2013). Kuczmarski, Robert J., Cynthia L. Ogden, Shumei S. Guo, Laurence M. Grummer-Strawn, Katherine M. Flegal, Zuguo Mei, Rong Wei, Lester R. Curtin, Alex F. Roche, Clifford L. Johnson. “2000 CDC Growth Charts for the United States: Methods and Development.” Centers for Disease Control and Prevention. Available online at http://www.cdc.gov/growthcharts/2000growthchart-us.pdf (accessed July 2, 2013). La, Lynn, Kent German. “Cell Phone Radiation Levels.” c|net part of CBX Interactive Inc. Available online at http://reviews.cnet.com/cell-phone-radiation-levels/ (accessed July 2, 2013). “Mean Income in the Past 12 Months (in 2011 Inflaction-Adjusted Dollars): 2011 American Community Survey 1-Year Estimates.” American Fact Finder, U.S. Census Bureau. Available online at http://factfinder2.census.gov/faces/tableservices/jsf/pages/productview.xhtml?pid=ACS_11_1YR_S1902&prodType=table (accessed July 2, 2013). “Metadata Description of Candidate Summary File.” U.S. Federal Election Commission. Available online at http://www.fec.gov/finance/disclosure/metadata/metadataforcandidatesummary.shtml (accessed July 2, 2013). “National Health and Nutrition Examination Survey.” Centers for Disease Control and Prevention. Available online at http://www.cdc.gov/nchs/nhanes.htm (accessed July 2, 2013). Given a confidence interval, you can work backwards to find the error bound ( EBM) or the sample mean. To find the error bound, find the difference of the upper bound of the interval and the mean. If you do not know the sample mean, you can find the error bound by calculating half the difference of the upper and lower bounds. To find the sample mean given a confidence interval, find the difference of the upper bound and the error bound. If the error bound is unknown, then average the upper and lower bounds of the confidence interval to find the sample mean.
. The distribution of sample means is normally distributed with mean equal to the population mean and standard deviation given by the population standard deviation divided by the square root of the sample size. EBM = = the error bound for the mean, or the margin of error for a single population mean; this formula is used when the population standard deviation is known. = the z-score with the property that the area to the right of the z-score is ∝2 this is the z-score used in the calculation of “EBM where α = 1 – CL.